Here are two extremes to think about. Most people take a middle course - tell us the kind of stuff you're interested in and we'll accommodate. Coffee and buns in the virtually unvisited medieval village at the bottom. Up to the monastery via a smaller convent with nice ceramics (2 hours walking time excluding breaks), up from the monastery to the summit (1 hour), down to the monastery (1 hour), then down to the village by a different route (1 hour) for a celebratory beer. We'll bump into other people in the section between the monastery and the summit, but are unlikely to in the first segment. If you're tired on arriving back at the monastery, we can take the cable car or rack railway down. Wine and log-fire-grilled meat in the virtually unvisited medieval village at the bottom. Up to a smaller convent with nice ceramics and the ruined hotel used as a hospital during the Civil War and in which the anarchist leader and assassin Juan García Oliver worked as a waiter. If the piano hasn't been completely destroyed, Mr Baldie will play it for you and sing 30s hits. 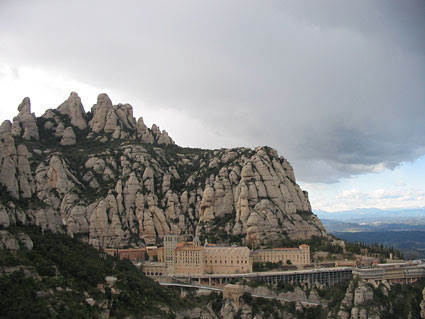 Then, avoiding the monastery, to the mountain tops by hidden paths (3.5 hours walking time excluding breaks). This route takes you to bits of the mountain where very few people come, and where there's a decent chance you'll meet wild goats and, with a very early start, wild boar. Up to the very top and then down by a different route, taking in a gorgeous Romanesque ex-convent and again avoiding the main monastery, to the first village for more booze and meat. The total ascent is 1000m. The scenery is spectacular, but none of this is in itself dangerous or unsuitable for people with anything but really bad vertigo. However, because the climb is so steep and the day so long and tiring, we can't take anyone who has problems with joints (hips, knees etc) with their lungs or heart.